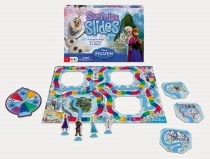 Enter for your chance to win the game Disney Frozen Surprise Slides. For ages 3+. Giveaway ends 12/5/14. Race to Elsa's ice palace.